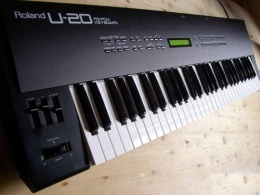 This is NoxiousPluK's Roland U-20. "The U-20 is nothing special. It is a digital synthesizer that uses ROM samples of pianos, brass, strings, bass, drums, etc. However it is built for professional use and is truly a quality instrument, even though its sounds may seem like dated-eighties synth pop cheese. It's got nice piano sounds, but they're not the real thing." The U-20 has issues with it's carbon conductive pads. It is fairly simple to clean them using alcohol but this is a short-term solution and only really works if you play it often. A better solution is to apply a new coating. You can find a good writeup/tutorial on doing so here. It also seems to have some ESD damage, but when the firmware crashes its quite easy to reset it. I'll document how to do this here asap (prolly the same NURD-Inn where it'll get fixed). If the synth is no longer in use, I'd like to see it returned to me including the flightcase! This video is using a U-220, which has the same sounds.